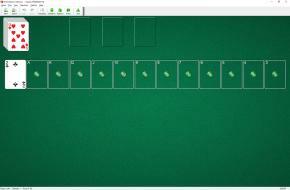 Display Solitaire uses 104 cards (2 decks). 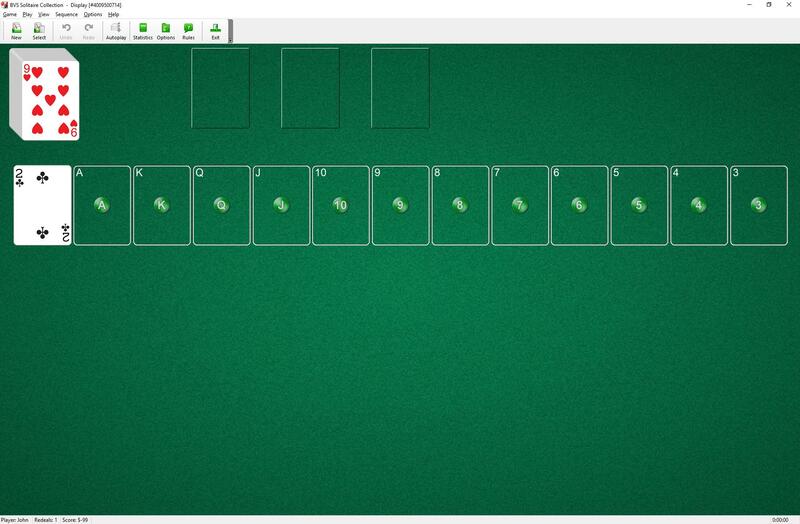 The first card is dealt into the first foundation pile. 12 other foundation cards - ( to form the descending sequence of thirteen cards regardless of suit ) are placed in the foundation row as they become available. However, foundations can only be started with their initial card in the given order. For example, if the first foundation is started from '10', the third foundation for '8' cannot be placed until the foundation for '9' is in place. To build the foundations up, regardless of suits, until each pile contains eight cards, wrapping from Ace to King as necessary. The top card of the stock pile is available for play on foundations. When you have made all the moves initially available, begin turning cards from the stock pile to any of the three waste piles. Cards from the waste piles can be used to build on existing foundation or to become a new foundation. There is one redeal. When the stock is empty, click on it to pick up the waste piles. On a redial, turn cards over from the stock pile to the single waste pile. Cards from the waste pile can be used to build on existing foundation or to become a new foundation. Cards cannot be moved from one foundation to another.